Just a few more days of The Next Fifty – the anniversary celebration of the 1962 Seattle World’s Fair – and we’re featuring artworks on the old fair grounds at Seattle Center. Head down to Seattle Center before the celebration ends on Oct. 21 and check out Alexander Liberman’s largest sculpture Olympic Iliad (1984). The artwork is a monumental agglomeration of steel cylinders located on the lawn surrounding the Space Needle. Liberman, known for his use of industrially manufactured materials, cut giant steel cylinders at varying angles and lengths, painted them an industrial red, and assembled them to form an immense structure that one can walk around and underneath. A similar artwork of Liberman’s, Iliad, can be found at the Storm King Art Center in Mountainville, N.Y.
Olympic Iliad was funded by private contributions, the Seattle Center Foundation and Seattle Center 1% for Art, and is part of the city’s permanent public art collection. Last week we featured Seattle Mural by Paul Horiuchi at Seattle Center’s Mural Amphitheater. Read more about that artwork here. IMAGE: Alexander Liberman, Olympic Iliad, 1984, steel cylinders. Photo by Amy Louise Herndon. Did you know that the City of Seattle owns nearly 3,000 works? Made up of 350 permanently sited and integrated works and 2,600 portable works, the collection is pretty impressive. And while you can probably name a few of them, we’re betting there are some surprises mixed in there. Which is why we’re kicking off a new weekly feature on our blog – a weekly art hit. It’s just a quick reminder of Seattle’s riches in the area of public art. As we post these, let us know – is this one of your favorite pieces of public art? What does it make you think of? What are you other favorites? Kicking off the series is an oldie, but a goodie. And it’s one that you probably didn’t know belonged to the City of Seattle! Hammering Man, located in front of the Seattle Art Museum, is often mistaken for SAM’s collection. But much as we love our friends over at SAM, we’re claiming Hammering Man as our own. Enjoy! Did you know that The Hammering Man by Jonathan Borofsky is part of the city’s permanent public art collection? Installed in 1991, Hammering Man is located outside Seattle Art Museum (SAM) at the corner of 1st Avenue and University Street. The 48-foot-high black silhouette sculpture is a worker and celebrates the worker’s contribution to society. He or she is the village craftsman, the South African coal miner, the computer operator, the farmer or the aerospace worker–the people who produce the commodities on which we depend. The sculpture outside SAM is the third largest Hammering Man on the planet. Taller versions are in Seoul, Korea and Frankfurt, Germany. Borofsky’s goal is to have several different Hammering Men placed around the world–all working simultaneously. Other big outdoor version of this work arein Japanand Switzerland. In the United States, there are Hammering Men sculptures in New York, Minneapolis, Los Angeles, Dallas and Washington D.C., among other places. In 1986 Seattle voters approved a public levy to provide funding for the design and construction of a new downtown Seattle Art Museum. The 1% for Art funds generated by the public levy were matched with other 1% for Art funds and donations from museum contributors to create “In Public: Seattle 1991,” a city wide celebration of public art. This project, at the time the largest in the history of the Seattle Arts Commission, brought artists from around the world to create permanent and temporary works in various sites throughout Seattle. Internationally recognized artist Borofsky was selected to create this major work for the entryway of the then new downtown Seattle Art Museum building designed by Robert Venturi. 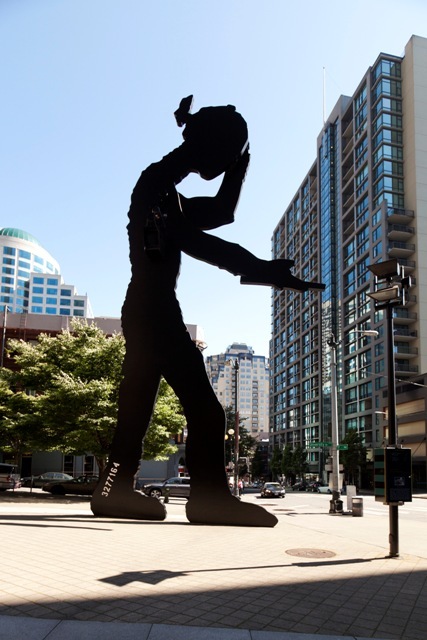 The Hammering Man was funded with Seattle Art Museum 1% for Art, City Light 1% for Art, the Virginia Wright Fund, and contributors of the Seattle Art Museum.